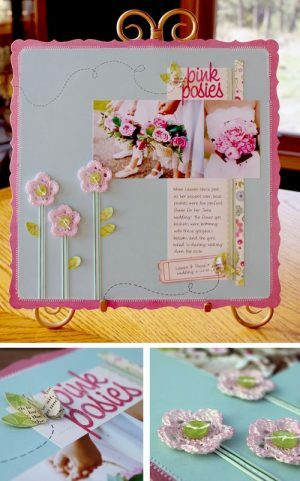 Since the Summer 2010 issue of Scrapbook & Cards Today came out on June 25th, I’ve received a bunch of emails asking me for the pattern to the crocheted flowers I made on my “Pink Posies” layout on page 45 (see below). 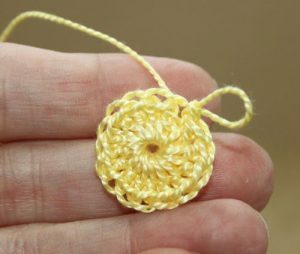 Even if you’ve never crocheted a day in your life, this is a super easy, little flower to make and you only need to learn four basic stitches to make one yourself! 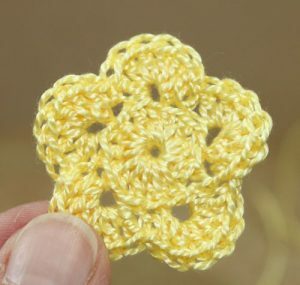 The following links will guide you through the basic stitches that you will need to learn in order to crochet this flower. A video tutorial is also available with each stitch! Super easy! For this sample, I used a 2.5mm crochet hook and #5 cotton perle yarn. 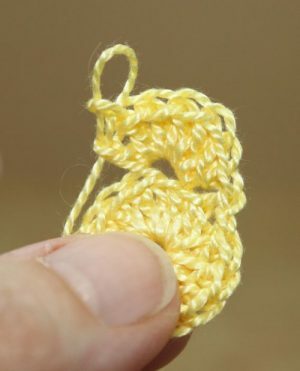 However, if you are just learning to crochet, start with a larger hook and a heavier yarn. repeat * three more times for five petals total; join with a sl st in first sc and fasten off. 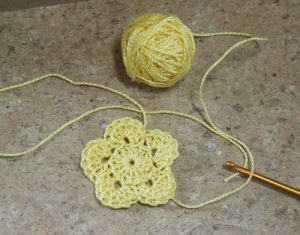 Run the yarn tail through a few stitches on the backside of the flower with your crochet hook and trim off. 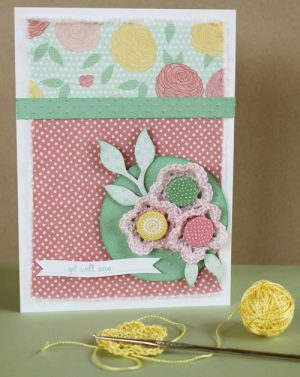 For this card, I crocheted three white flowers and lightly sprayed them with Cherub Pink Glimmer Mist. Once dried, I popped a Dear Lizzy fabric-covered brad into the center of each flower. 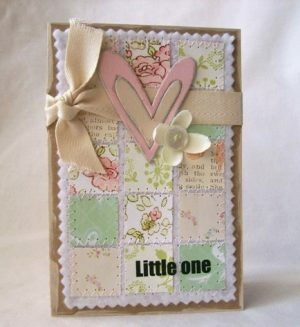 Two torn pieces of Dear Lizzy fabric paper gave my card the perfect touch of homespun charm. Join me again Wednesday and see a unique spin on my favorite summer fruit!